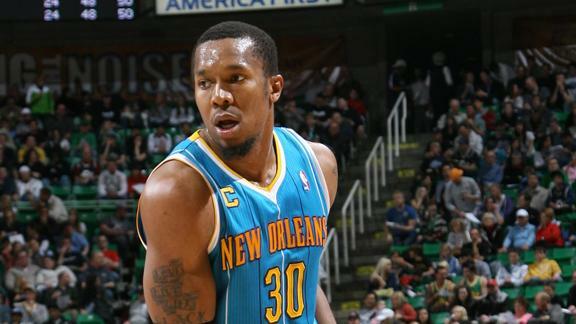 The Boston Celtics were reportedly heavily pursuing a sign and trade option to acquire David West from the New Orleans Hornets. West is now expected to sign with the Indiana Pacers after his proposed move to the Celtics collapsed. However, losing out on West is not really losing at all. It is understandable why Danny Ainge was interested in acquiring West, but the risk with the 31-year old heavily outweighed the reward. As a starter in New Orleans, West has averaged averaged somewhere in the region of 20 points per game the past six seasons as well as a career average of seven rebounds per game. Obviously those numbers are attractive, especially to a team like the Celtics that struggled with bench scoring last season. However they don't accurately reflect what West would have been capable of in Boston. The Celtics biggest need, outside of reeling in Rajon Rondo, is finding a quality starting center. David West is not a center, West is a power forward who would either move Kevin Garnett to the center position, which is not ideal, or be a bench player and serve as an expensive backup. For basketball reasons, that still appears like a pretty good addition for Doc Rivers' side. That is ignoring West's injury from last season however. West did feature in 70 games last year but tore his ACL in April. An ACL tear, or anterior cruciate ligament of the knee, is something that the Celtics are experienced in dealing with as Kevin Garnett suffered the same injury in the 2008 season. It was obvious to all onlookers that Garnett took two seasons before he was back to 100 percent. While the rehab period for a player coming back from a knee injury of this type is generally around nine months, the full recovery to the desired level of performance can take twice that. At 31 years of age it is no guarantee that West's recovery is easy on him either. The older you are, the more difficult it is to heal. Instead of spending $10 million, which is what the Pacers are paying West, for a backup power forward that had more promise than guarantee, the Celtics can now save that cap space and make another move for Chris Paul or improve the team in areas of real concern. As for the power forward position, trading Glen Davis for Brandon Bass should prove to be an astute addition. Bass has greater length than Davis and is arguably the better all around player. He should bring a greater physicality to the team's forward line after playing in Orlando for the past few years. The Celtics didn't re-sign Davis because of his financial demands, ultimately they got a better player for a cheaper price. The Magic were likely only willing to deal Bass because Davis is one of the players that Dwight Howard asked the team to sign. Their mistake should be the Celtics gain. Bass should provide quality minutes that will make Celtics fans forget about David West pretty quickly.